The Atlantic Sailfish (Istiophorus platypterus) named “Sparky” (Tag ID: GFR9196) was originally tagged & released by angler Rick Hopkins on February 5th, 2016 while fishing with Captain Raymond Baiz and mate Justin Miller aboard the charter boat Reel McCoy, out of Bud N’ Mary’s Marina in Islamorada, Florida. The Sailfish was estimated to be 60 inches (152.4 cm) total length and had an approximate weight of 25 pounds. The Sailfish was recaptured 8 days later on February 12th, 2016 by angler Andrew Duke while fishing aboard his boat Duke’s Dusky out of Fort Lauderdale, Florida. 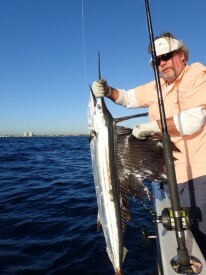 Andy recaptured the Sailfish near the Dania Beach Pier in 150 feet of water while drifting with a live pilchard. 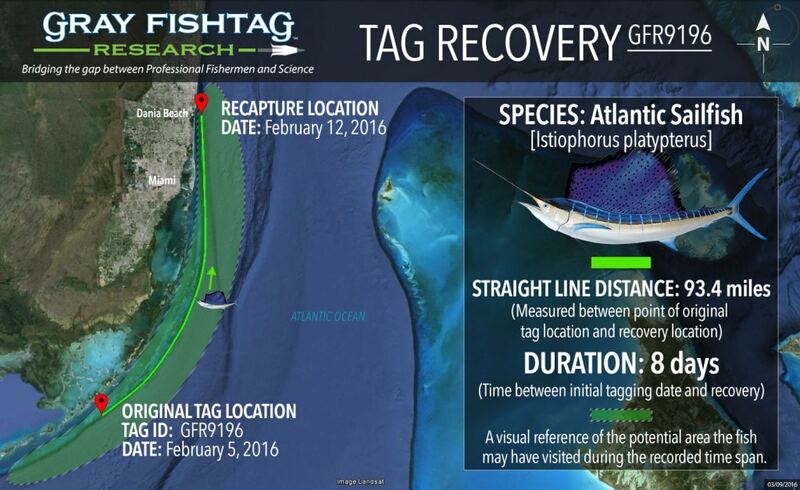 This recapture location is approximately 93.4 miles north of the original tag location. During that 8 day time period, the Sailfish most likely stayed in the local South Florida waters around the continental shelf edge. That area is ideal habitat with its proximity to the coral reefs, the reef edge and the abundance prey items (pilchards, sardines, small mackerels, etc.). At the time of recapture, the Sailfish had an estimated length of 60 inches and weight of 30 pounds. Based on the estimated length, this Sailfish was a probably a juvenile fish. Western Atlantic Sailfish reach maturity at a lower jaw fork length between 121-146 cm. After the tag information was recorded, the Sailfish was subsequently released healthy and unharmed. The Atlantic Sailfish exhibits a dark blue color with white and brown spots along the ventral side of the body. There are also approximately 20 vertical running light blue bars. The body color can vary depending on the level of fish excitement. Sailfish is the most coastal of all the billfish species. 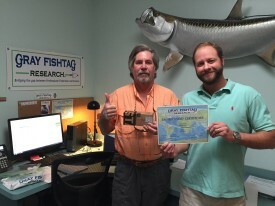 Tags are provided free-of-charge to the collaborating professional fishermen, and the tag data is available to the public at GrayFishTagResearch.org. The Reel McCoy charter boat crew will receive some Gray FishTag gear for their tagging efforts. Andrew Duke will receive a pair of Costa Del Mar sunglasses, a Tag & Recovery Certificate, and Gray FishTag gear for reporting the tag recovery. AquaWorld, Crocodile Bay Resort, Grande Alaska Lodge, Los Sueños Resort & Marina, Marina Pez Vela, The Pisces Group and The Zancudo Lodge.